Arsenal’s Young Player of the Year Revealed. Who Will it be Next Season? Although he dropped out of the first team towards the end of our recent campaign, taken overall, 2016/17 was a successful breakthrough season for Alex Iwobi. Alexander Chuka Iwobi, still only 21 years old, made 38 appearances in all competitions last season, 25 of them coming with him in the starting 11. Overall, he made a good impression, especially on Alexis Sanchez, who recently rated Alex as the best young player at Arsenal. Iwobi only scored four goals last season which has to be an aspect of his game that he needs to work on as an attacking player–not that he’s alone there! Arsene Wenger will be acutely aware of Alex’s development, of how he needs to push on over the next 12 months, and how Arsenal’s transfer business in the summer must be executed so that it doesn’t hamper that development. It’s a fine balancing act for Arsene as Iwobi could become a really important player for us next season. 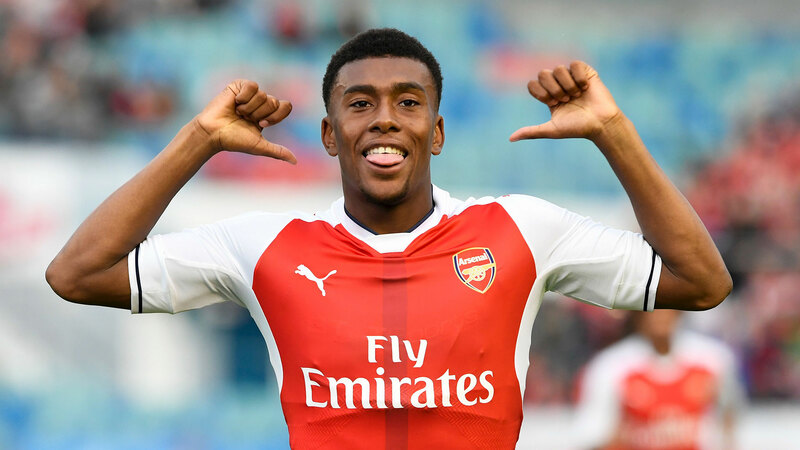 A young player can grow enormously in just a year and Wenger will not want to stunt that growth by bringing in players who could block off and frustrate a football education, that, in Iwobi’s case, is at a crucial stage. That priority, however, has to balanced against the here and now. Arsene knows only too well the clamour he faces for new signings this summer in what is possibly his most important transfer window since 1997. At the same time, Wenger will always try to develop home made talent. Of course, Iwobi’s situation isn’t helped by the unnecessary, selfish and rather crass comments coming from within the Nigerian Football Association, where certain officials in that organisation have urged Alex to leave Arsenal to get more game time. Fortunately, Alex is surrounded by more sensible people at Arsenal who are advising and guiding him towards a long term and fruitful career rather than allowing him to be swayed by the short term needs of a national team coach. Alex has been the breakthrough story of 2016/17. Who is going to be the next player to take that giant stride for Arsenal in 2017/18? With Wenger looking to move on as many as eight players this summer and not wanting to bring in more than three or perhaps four new signings, there must be opportunities for two or three youngsters to establish themselves in the senior squad this coming campaign. Jeff Reine-Adelaide, still just 19 years old, spent most of last season–in fact the last two years–in and around the senior squad, gradually growing and maturing. He had only six appearances with five starts last season but this could be his time. Arsenal playing in the Europa League should, in the early games at least, offer “The Jeff” the opportunities to showcase his talents and he’ll likely get more game time in other competitions even if it’s only from the bench. Reine-Adelaide has all the attributes to be a top player. All he needs are minutes on the pitch, and, with the upcoming double of Europa League and League Cup matches to look forward to, he should enjoy a lot of exposure. Ainsley Maitland-Niles, also 19 years old, spent 2015/16 on loan at Ipswich Town, where he made a good impression, despite his mother. Last season he was retained at Arsenal, making seven appearances and slowly being integrated into the senior group. Maitland-Niles has now been told by Wenger that he has been promoted to the first team squad permanently. That–and his recent success as part of England’s U20 World Cup winning squad–should set AMN up for a breakthrough season. Ainsley could well find himself sharing a central midfield spot in both the Europa League and League Cup competions alongside more senior figures like Francis Coquelin and Mohamed Elneny, especially as it appears that Santi Cazorla may not being available until late October or early November. Maitland-Niles is a flexible player who has played in various midfield positions as well as at right back. If Arsene continues the three-at-the-back experiment which served so well at the tail end of last season, it could be just the catalyst for Maitland-Niles to establish himself. With Krytian Bielik being lined up for another season on loan, the two above are my strongest tips to follow in the footsteps of Alex Iwobi. I suspect that Chuba Akpom, Dan Crowley and Gedion Zelalem will be off on loan again, whilst the future of Chris Willock still remains uncertain. But that’s just my opinion. Maybe there are those among you who avidly follow the academy and have some tips of their own. If so, let’s have them. OK chaps, that’s ya lot. 23 Responses to Arsenal’s Young Player of the Year Revealed. Who Will it be Next Season? Well written Kev, you have a pretty good knowledge of the youngsters, more so than many of us who are relight on the press etc. Iwobi did really well yesterday, he bought an element of fresh air to the team, when it was much needed. Unfortunately he was never going to maintain that level for the season, so it has to be regarded as a success. I may be wrong but I seem to remember in the past, that young players (Charlie George, Liam. Brady, Frank Stapleton, David Rocastle etc to name but a few) were nursed into the team. It seems to me the constant drive for success means this doesn’t happen so much these days. When a young player gets a chance these days he has to hang on for dear life. Hopefully the Thursday cup will allow some of then to get a chance. Cheers Retsub, I seem to recall that Reiss Nelson has also been promoted to the senior squad, I’ve not seen him play but he is rated very highly from within the club I understand. Thanks for the edit 17tino. Great stuff, Allezkevski. Iwobi is a fabulous player and not far from a breakthrough. Thanks for your maiden post and I am now looking fwd to the next season and see who will make it of the young ones you presented!! Well written Kev!! I really like the look of Iwobi as a future CAM option. I think he has great dribbling and goal scoring potential. The biggest challenge for the likes of Iwobi, Crowley, Toral, Maitland-Niles, Neilson, Bielik and even Holding and Chambers is getting game time at Arsenal. With more senior players ahead of them and Wenger’s not inclined to regularly and systematic rotate his starting 11 players , I think a lot of those youngsters will find game time quite limited next season. In terms of their further development, that’s a concerning prospect. As we’ve seen many times with talented and emerging youngsters, game time is an absolute must for them to continue their growth. For that reason, I actually think those youngsters would benefit more from being loaned out next season to club where they will be virtually guaranteed game time in their ideal position, than spending the whole of next season training with the first team and sitting on the bench match after match. For Arsenal that would mean the club would need to recruit a couple of experienced and proved players (e.g. a CB, a CAM) to serve as back up to the first choice players. Doing so would allow the club’s youngsters to continue to develop, until such time as prospective starting roles at Arsenal emerge, without Arsenal diminishing the quality of the club’s squad. You sure know how to take care of the ‘little’ things. While we are all engrossed withe the Mbappe saga, you are quietly fishing out the Jeffs and the Nelsons. That’s great. Mainland-Niles appears to me the most ready. He’s got a mentality matured above his age and his physique is no disadvantage. I love players who are good on both sides of the ball and he is one. The Europa league and the Cup games will provide him the platform for entry into full 1st team participation. Jeff is a bundle of talent, the Abu Diaby kind. He seems to have it all but needs to quicken his playing rhythm a wee bit more. This might delay his full 1st team entry for another season. Reiss Nelson already has that quickness but he needs to bulk up more. There will be fringe appearances for him. All according to my valuations, mind. I forgot to include Kelechi Nwakali. I don’t know about his work permit status. Kelechi is a wonderfully well rounded player, a super athlete. Tackles, dribbles, vision, all ranges of passes, pace, shots, balance, rhythm, just name it, he’s got them all. He reminds me of Paul Pogba maybe with slightly better potential at same age. There is no weakness in his game. 3 yrs from now he will be a commanding presence in the Arsenal team. Cheers Total, glad you enjoyed it. Waldo, despite the financial and esteem aspects of dropping out of the CL, I’m quite optimistic that the UEFA Cup could prove very beneficial for our young players, their development and the exposure they’ll hopefully get playing in the early rounds at least. A bit of imagination from Arsene, mixing some experienced heads in with the likes of Jeff, AMN, Iwobi, Nelson perhaps, Ntekiah possibly, others off of the bench and we could have a very enjoyable tournament. I’m really looking forward to it despite the Thursday/Sunday fixture nonsense. Yes, they’ll be a few loaned out for sure, but with up to 8 players leaving, I reckon, there should be opportunities, injuries, suspensions etc. PE, agree totally on AMN, he looks ready to me. Nwakali is an interesting one PE, he had a pretty good season on loan and if a work permit can be arranged then he could join the group, but I suspect he’ll be off on loan again, not least for him to grow physically. The Premier League is an unforgiving competition. What about Akpom–who looked very close to the first team a year ago? He got loaned to Brighton, right? They won the Championship and his wiki-page says he made 10 appearances but scored no goals, so it’s hard to say if he contributed. Does anybody know what’s up with him? Hi 17tino, been really busy last few days, but thanks mate. The title, I quite understand mate, it wasn’t an issue for me, I always leave that up to the editor. Chuba Akpom has been a disappointment to me, so far, he looks the part but there’s not much point if as a forward you’re not hitting the back of the onion basket. I saw him a couple of times, once at Borehamwood when he was about 17 and from the subs bench at the Emirates and he looked the complete package. Sadly he hasn’t come through as I would have hoped. His return at Brighton, a team that was flying, was very unimpressive. Maybe with the UEFA Cup pending, the club might give him a chance in the cups, up till the January Window? But with Nelson, Ntekiah and Mavididi all younger and developing beyond Chuba it seems, the future for him will probably be a rebuilding job in the lower divisions, a la Benik Afobe. Talking about our youngster is always interesting..
For this season to come I hope AMN and JRA will get their chance..
Youngster isnt an easy thing to handle.. You can’t force they will be good as quick as you wish..
Pogba is a very good example..
Is a very stupid thing MU did.. to let him gone for free to Juventus and than bring him back for 100M.. I always laugh Everytime I mention it.. hehehe..
It’s maybe will record as the biggest crazy history of all time.. hehehe..
We also almost did it with some of our own.. Gnabry and that OO for the closest example.. But we knew Wenger will never did it.. Never in a million way.. for free maybe.. hehehe.. I wonder if we bring Mbappe last season.. Will he got as much time as Monaco give him..?? We need a more mature stable players and at the same time we also want to get a miracle happened with our youngster.. hehehehe.. I wish JRA and AMN will shine.. But like I said before.. I doubt the get enough time.. Iwobi also.. We will never see him again playing as our Winger, cause we we will playing 3-4-3 all the season..
And As the Fans and maybe also the Club now force Wenger to bring a talented stable expensive players.. Their time will be more limited.. We will see some great midfield coming to cover Ozil or maybe Ramsey will do that part, and we bring some more DM..
And I hate to know that my Takumo Asano will never been playing for Arsenal also, cause with all the pressed that Wenger had, he wont do more speculation this time.. So that I will never see an Asian players in Arsenal.. hik3x..
Takumo Asano is one of Arsenes punts a bit like Ryo Miyaichi. I think the club would love a player from your part of the world, someone who could earn a spot in the squad, it would be great for spreading the club’s profile and great for all our fans out there. I imagine that Asumo will get another spell on loan next season, maybe at a British club? Kev. I appreciate the games has changed because of money Etc it does however seem almost impossible for youngsters to make it at Arsenal these days. Iwobi is a very rare example. I am sure I have missed a few, but I can only remember Cashley Cole going on to be really successful (await the list nervously ). Arsenal youngsters often threaten to go onto great things but invariably seem to end up in the lower divisions. Do you think that is just a sign of the times and a similar story as other prem teams? Or are we doing something wrong? Or am I talking a load of old rubbish? I think it’s a combination of things mate, but talking of Combination (League and Cup) those were invaluable competitions as they pitted our young pros against teams of mixed youngsters and fringe first teamers either out of form or recovering from injury, who could pass on their experience to the youngsters in a competitive match scenario. The Combination was also where Dads would take their sons and daughters and introduce them to top level football, be it the Stiffs and Highbury as it was. And how I miss Highbury Retsub..
Young players used to be cut a lot of slack by a knowledgeable crowd, in fact our crowd was superb with young players, giving them encouragement, but things are not as they were. Kev, yep I remember seeing how many goals scored for the reserves before he got his break and how much we looked forward to seeing him make his debut. What a great centre forward before he became a traitor. I agree about Highbury, as nice a stadium as the Emirates is, it lacks character. It just a symmetrical oval if that makes sense? I must have had at least 4 or 5 places you could get a decent view when you were just a kid at Highbury. I started off behind the half time scoreboard at the clock end. Me too Retsub (just home from a long shift) my Dad started me off on the Clock End, watching the reserves, after Arsenal won the 70-71 Double I joined all the herberts up the North Bank, stayed there till about 1987, then back to the Clock End till I got my first season ticket, West Stand lower 1990, but like you I’ve been in all of it, as it was, other than the boxes. The Emirates is nice, but I guess it lacks a bit of history and as you say it’s just another oval. When we started every ground was distinct and you could recognise the main ones without being told. They’re all a bit samey now, a bit sanitised. Kev, thanks for the personal gift. Kelechi game is so uncluttered and he seems to understand good positioning. There is a certain commanding air about hiim on the field that’s bound to attract a lot of attention. I believe he will rise quickly. I expect that Wenger would include him in the pre-season squad so he can assess him from close quarters while also exposing him to the Arsenal way. Calum Chambers played the full game as England commenced their U21 European Championship campaign with a goalless draw against holders Sweden today. England had goalkeeper Jordan Pickford to thank for saving a penalty from former Arsenal trialist Linus Wahlqvist. Meanwhile, Krystian Bielik was an unused substitute as hosts Poland were beaten 2-1 by Slovakia. Hector Bellerin’s Spain face Macedonia tomorrow. I guess my real question is: are results all that matter?